Michigan Audubon’s Purple Martin conservation efforts focus on outreach, education, on-the-ground conservation, and research to increase awareness for Purple Martins and slow or reverse the population declines they have experienced across the state. While the global population is stable, Michigan’s Purple Martins have been experiencing consistent, steep population declines since 1966 according to the Breeding Bird Survey. Lack of properly sited and managed nesting structures are a limiting factor for breeding Purple Martins as they rely solely on human-made structures for nesting in this region. Michigan’s Purple Martins need everyone’s help to thrive in our state — please join us! Check out our seasonal monthly Michigan Purple Martin Friends newsletter! Each issue contains information on a timely topic such as nest monitoring, supplemental feeding, and nest changes. Understanding where current Purple Martin colonies are in the state is an important step in conservation. We are building a map of these current and historic locations, which can be viewed below. If you have data to share – please use the form below to register your colony or contact us to discuss other data upload options. Are you a Purple Martin Landlord in Michigan? Check out the Facebook group Michigan Purple Martin Friends to ask questions, post photos, and share updates from your colony! Adult male: Iridescent dark purple overall.Subadult males resemble females, but have a few purple feathers on the belly, chin, throat, or undertail. Adult female: Gray-brown overall. Small patches of iridescent dark purple on head or back. Gray-brown belly. Juvenile: Gray throat and neck. Dark wings and tail. Wings longer than tail. Pale whitish belly. Yellowish inner bill. 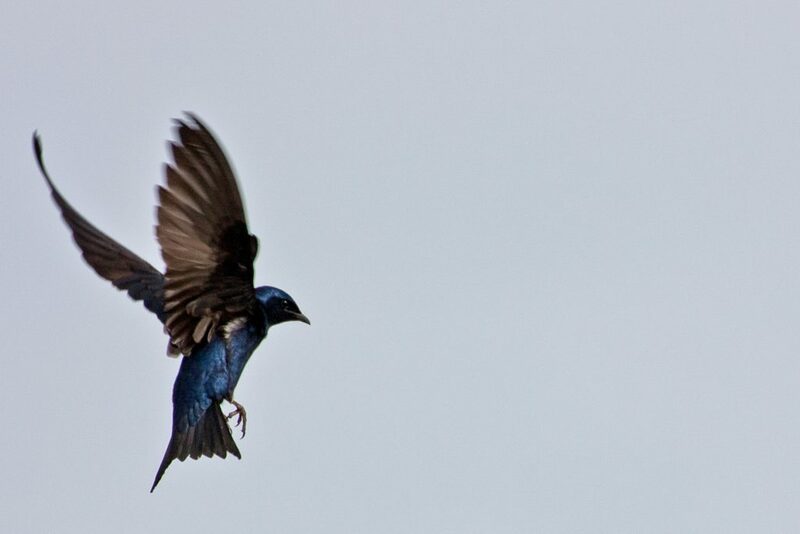 Behavior: Purple martins are aerial insectivores, meaning they feed by catching flying insects. They are one of the highest flying foragers and can be seen hundreds of meters in the air. These birds are most often seen swooping and diving in open spaces, but do come down to perch on posts, wires, dead snags, or martin houses where they have a good view of their surroundings. Habitat: Open areas, usually near human houses, with room to swoop and catch flying insects. Often found near water where flying insects are abundant. Lakes, shorelines, open fields, golf courses. Food: Dragonflies, flies, butterflies, wasps, and other flying insects. 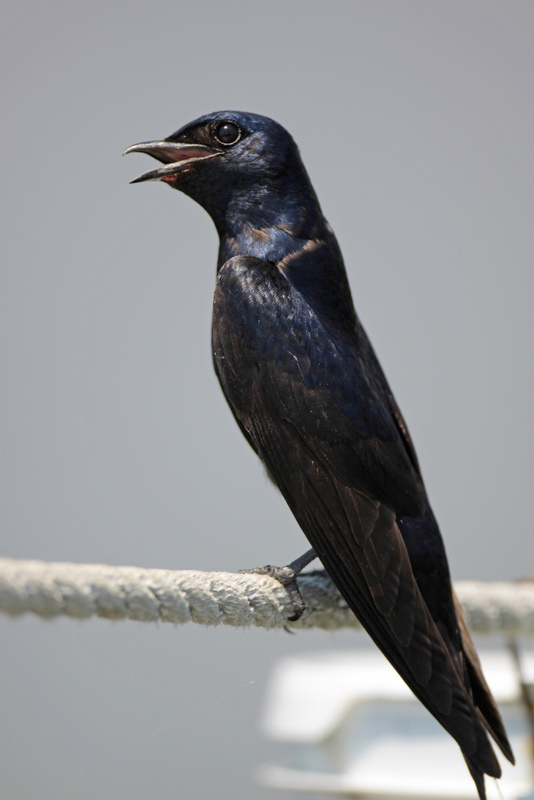 Housing: Purple martins are social birds that nest in groups (colonially). Martins nest in gourds or houses that provide multiple “apartments.” Houses are mounted on poles 15’ – 18’ tall, 40’ – 60’ away from trees, and 30’ – 120’ from human housing. Set up the right house in the right place. Houses are mounted on poles 15’ – 18’ tall, 40’ – 60’ away from trees, and 30’ – 120’ from human housing. Purchase housing from places knowledgeable about Purple Martin needs, such as the Purple Martin Conservation Association. Learn about the best location for a martin house and what type of housing is best for martins at the Purple Martin Conservation Association’s website. Watch out for predators. Use a pole guard to prevent raccoons, squirrels, or other climbing predators. Install owl/hawk guards to prevent aerial attacks. Avoid using pesticides in the yard. Insects are Purple Martin food. Create native plant habitat for insects (martin food) to thrive. Learn about bird-friendly native plants. Share your experience with others. Invite your neighbors, lake house association, or local community leaders to see your birds. Manage for invasive species. 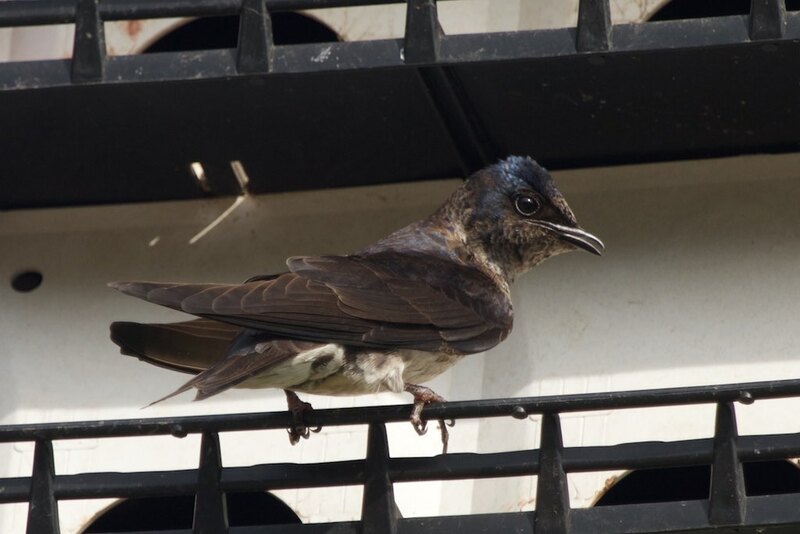 Good Purple Martin landlords prevent invasive bird species from nesting. These aggressive birds will injure or kill Purple Martins and destroy a colony. 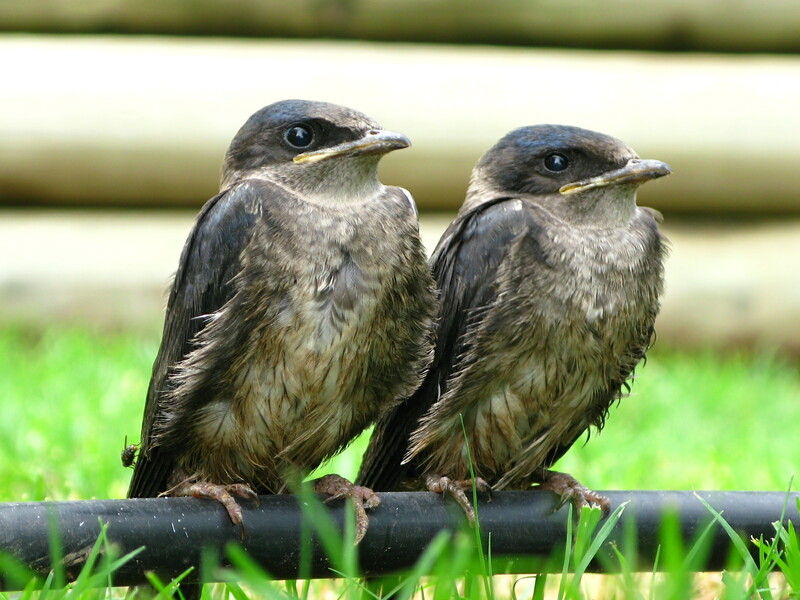 It is legal to remove nests, eggs, or adult House Sparrows and European Starlings. Learn more about non-native, invasive bird management or purchase traps at the Purple Martin Conservation Association website. Male House Sparrows have a distinctive black bib, while females are overall a dull brown. 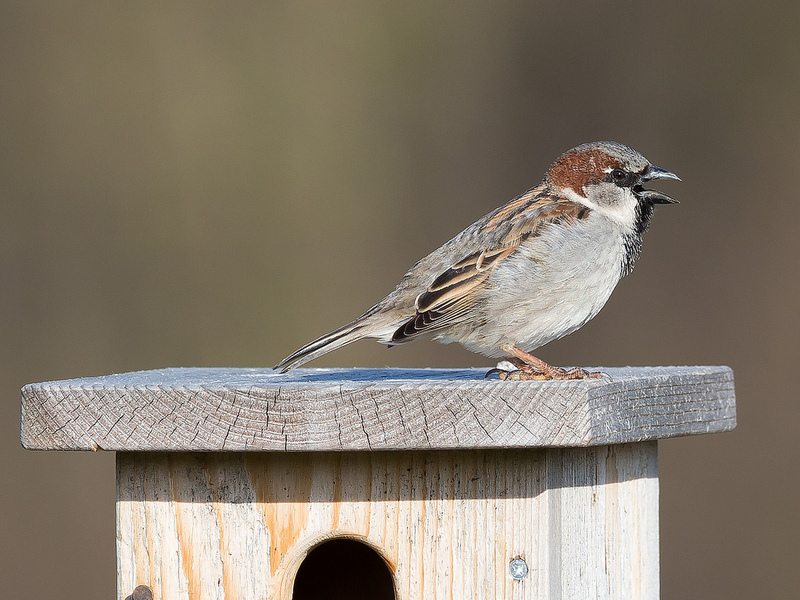 House Sparrows are the only species of sparrow that will use a man-made house, but be sure to correctly identify this species before removing it. There is no special opening that will deter House Sparrows since they are close in size to Purple Martins. The most effective removal method is trap and removal to ensure this species is not damaging your martin colony or someone else’s. 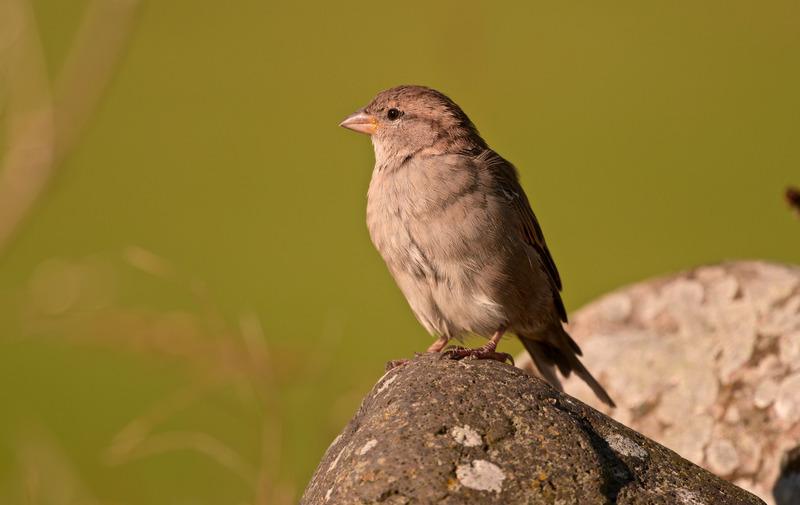 Read more about House Sparrow myths. In breeding plumage, both male and female European Starlings are iridescent green-blue and black, with a distinctive yellow, pointed bill. 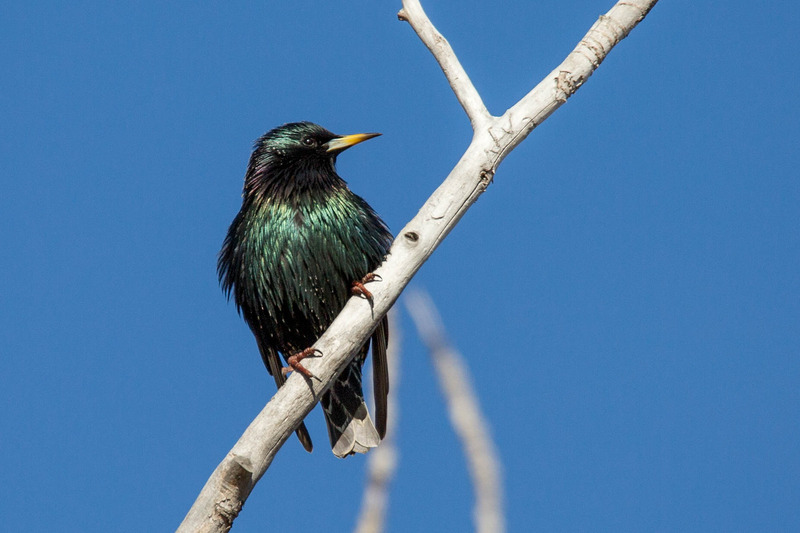 European Starlings are much larger than Purple Martins and can be prevented from using housing by using non-round, starling-resistant holes. Trap and removal is the most effective method to ensure this species is not damaging your martin colony or someone else’s. The PMCA are leaders in developing quality martin products and they provide support for members to learn best practices to establish and maintain martin colonies. The PMCA leads citizen science projects including Project MartinWatch and a Scout Arrival Study. Through Project MartinWatch, the organization collects nest monitoring data from Purple Martin landlords across the country, and uses that data to understand how populations are doing nationwide. The PMCA is an international tax exempt, nonprofit organization dedicated to the conservation of the Purple Martin (Progne subis) through scientific research, state of the art wildlife management techniques and public education. The PMCA’s website provides all of the resources needed to become a successful Purple Martin Landlord. Michigan Audubon’s Purple Martin Conservation program aims to increase awareness for this regionally declining species, collect data on distribution and size of the Michigan Purple Martin population, help establish new colonies, and unite Purple Martin landlords across Michigan. Purple Martin landlords can contribute valuable data to help Michigan Audubon gain a better understanding of the local population. Experienced landlords can become mentors for those trying to establish new colonies. A map of Purple Martin colonies across Michigan is growing; be sure to register your colony to join the flock! By registering your colony (past or present) you are helping to shape a more complete picture of where these birds are and how they are faring statewide. Your contributions are part of the conservation solution; thank you!